Who Says You Don’t Get Second Chances? Judith Sapol is a Registered Nurse who has always had a keen eye for fashion. When she no longer chose to do nursing she decided to “recycle” herself and use that sense of fashion in a new business venture of “recycled” fashionable clothes. Hence, the beginning of an adventure with “Sophisticated Ladies Consignment Boutique” an upscale consignment boutique that was born in Chadds Ford and is now in a new and larger venue on Route 202 in Glen Mills, PA. This is not a thrift shop! This is a place to buy “upscale fashions at a mere fraction of their retail cost”. What and why do people want to consign? Today, with living expenses being so high and styles constantly changing, women want to be fashionable while saving money. 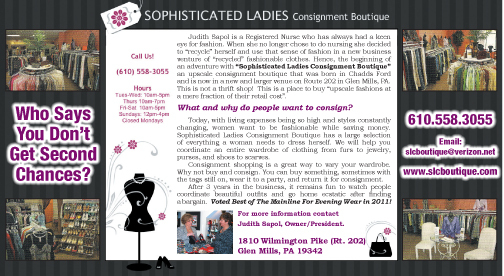 Sophisticated Ladies Consignment Boutique has a large selection of everything a woman needs to dress herself. We will help you coordinate an entire wardrobe of clothing from furs to jewelry, purses, and shoes to scarves. Consignment shopping is a great way to vary your wardrobe. Why not buy and consign. You can buy something, sometimes with the tags still on, wear it to a party, and return it for consignment. After 3 years in the business, it remains fun to watch people coordinate beautiful outfits and go home ecstatic after finding a bargain. Voted Best of The Mainline For Evening Wear in 2011! For more information contact Judith Sapol, Owner/President. ← Previous Story Ming Wang!